Well, not in pounds or dollars. But, according to WordPress.com and to my considerable surprise, this blog has now had over a million impressions since I started it, 3 and a bit years ago. OK, I know Joel Spolsky or Jeff Atwood probably wouldn’t get out of bed for a meagre million impressions, but I still couldn’t resist crowing about it. As you can see in the graph below the traffic is very uneven, dominated by a few posts that made it on to the front page of social news sites. As with many things in life, persistence is the key. Choose your audience and write for that audience. Pick a realistic posting schedule and try to stick to it. The titles of posts are important. Don’t expect lots of clickthroughs from social media sites to translate to lots of subscribers. Get your posts proof read (thanks Claire!). 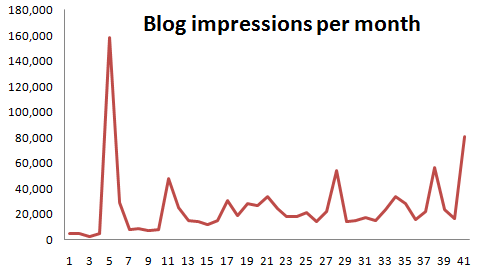 I am lousy at predicting how much interest a particular blog post will generate. Be prepared to break the rules from time to time. Although time is sometimes scarce for blogging I have lots of ideas for future blog posts. But if there is anything you would particularly like to see on this blog, please leave a comment. This entry was posted in blogging, software and tagged blog, statistics, wordpress on 2 September 2010 by Andy Brice.